A root canal treatment is a procedure used to save a tooth from infection. Having a root canal done on a tooth is the treatment of choice to save a tooth that otherwise would die and have to be removed. Teeth are composed of three different layers: The hard outer layer of enamel, the middle layer of more sensitive dentin, and the inner layer of pulp. 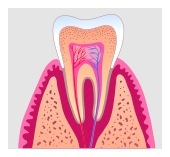 A tooth’s pulp is in the cavernous space where the tooth connects to the nerve through the root canals. Under normal circumstances, the pulp has no exposure to the outside world. During one’s lifetime, the pulp may become diseased due to a variety of reasons (decay, trauma, deep fillings, cracks, etc.). This can be extremely painful and lead to an abscess if left untreated. Elimination of the diseased pulp can be accomplished in two ways: extracting the tooth or saving the tooth by performing endodontic therapy. Root canal treatment is an endodontic (inside the tooth) procedure in which your root canal specialist (endodontist) will remove the dead and dying infected tissue. Despite the common belief that root canals are excruciatingly painful, in actuality, they cause very little pain and discomfort. In fact, root canals actually relieve tooth pain. Briter Dental in Katy is here to help. Advanced techniques, tools, and materials make the procedure faster and more comfortable than ever before. Most treatments last between 30 and 60 minutes. Once the pulp is removed, your dentist at Briter Dental, will clean out the tooth and shape the canals. To prevent the infection from reoccurring, the tooth is filled, usually with a rubbery substance called guttapercha. A seal is put over this filling, and usually, a crown is placed over the tooth to safeguard against fractures or further structural damage. To learn more about root canal procedure click here! If you have any questions about endodontic procedures like root canal therapy and live in Katy, Houston, or the surrounding area, give Briter Dental a call today.